13 But he stands alone and who can dissuade him? The story of Job is revealing. It speaks to our human concerns regarding the nature of God and God’s relationship with creation. It addresses the perennial question of the existence or presence of God amidst human suffering. If God is truly loving, then why does God allow suffering? The easiest answer is that we get what we deserve. If you are suffering you must have done something to deserve it. The poor experience poverty because of their failures. Women are assaulted and raped because of the way they dress. You have heard the message time and again. But reality is never that easy. I don’t know that there are any easy answers and solutions, at least not ones that assume God’s omnipotence. It is in the context of questions like these that Job often speaks. Here is the righteous person, who has done everything he can to keep himself holy, and he makes sure that he pays any debts owed to God by his family. He’s the kind of person you want on your church board. He’s honest, faithful, hard working. As we learned in the first reading last week, the reading from Job 2, God is impressed by his righteousness. But, then God goes and messes with the paradigm by engaging in a wager with Satan that allows Job to be put through a living hell. Despite his suffering, Job clings to his sense of righteousness, and despite the encouragement to do otherwise refuses to curse God. In this second reading from Job, we hear Job complain bitterly about his situation. He may not curse God, but he would like to have a word with a God who appears to be absent. His bitterness is compounded by the conversations he has had with his so-called friends. In the intervening chapters, which we have skipped over, Job’s friends, who at first came to comfort him, have in turn urged him to confess his sins so he might be saved from his torment. His friends embrace a vision of reality, Job likely once held, that sin leads to suffering. We call this retributive justice—we get what we deserve. Having heard Job claim innocence, Job’s friends rebuke him. Their interpretation of Job’s plight starts with the suffering and works back to the “cause,” which must be Job’s sins. Again, this is easy to do. Bad things happen to bad people. We have been seeing it influencing our politics as we eat away at the safety net, threaten to take funds from under-performing schools (rather than providing more resources, we take them away), and turn away refugees fleeing from humanitarian disasters. There is, of course, the flip side to this. If you are rich or successful, you must be righteous. Job has been responding to these arguments with a series of rants, complaining to whoever listen, that he is innocent. He resists the arguments of his “friends,” who are offended by his ongoing confession of innocence. However Job may feel about things, his defenses do not mesh with their theological system. He has upset their religious and cultural values. Yes, he’s unorthodox. I expect that Job wants to agree with his friends, having embraced their theology, but it no longer works. It doesn’t fit his experience of life. Therefore, there must be a different answer. As that answer doesn’t seem to be forthcoming, he cries out in bitter complaint. If you’ve read the first couple of chapters, you know that Job has a reason to be bitter. You would be too! He could go along with his friends’ advice and confess to sins he doesn’t believe he’s committed, but he’s not going to do so. In the omitted verses you get a hint that Job is hopeful that he will be vindicated. God might be absent, but things will work out. In any case, God will do what God wants (see verses 10-15). Many of us were taught that it was not appropriate to argue with God. God knows best, so don’t protest. Just take it in. Fortunately, Scripture offers us a counter view. Many of us have found encouragement in Job’s rebellious response to God. Now Job doesn’t curse God or give up faith in God, but Job is willing to lay it on the line with God. If only I could find God, I would give God a piece of my mind—something like that. Job speaks to the times in our lives when we feel we are suffering unjustly. He speaks here of his sense of God’s absence. We all have felt the same. Yes, we know that God is always and everywhere present (it’s an article of faith—we call it omnipresence), but that doesn’t mean we don’t feel otherwise. We see similar complaints in the Psalms, and this is in its own way a Psalm. Does this not speak to where we find ourselves at this moment in time? Churches are trying to be faithful, but they’re struggling. They see other churches thriving and wonder why they can’t. It does seem as if we’re wandering around in the dark. The choices seem to be living in despair or fighting on. So, here we are, in the dark, making our case. We cry out—where are you God? At one level this doesn’t preach. We want a message of success. We want to hear about light. That is not the message for this week, at least from Job. But, maybe, just maybe, we’ll find solace here. If we persist, perhaps God will hear us. At least that’s Job’s hope. Job Talks to God, from Art in the Christian Tradition, a project of the Vanderbilt Divinity Library, Nashville, TN. http://diglib.library.vanderbilt.edu/act-imagelink.pl?RC=55467 [retrieved October 8, 2018]. 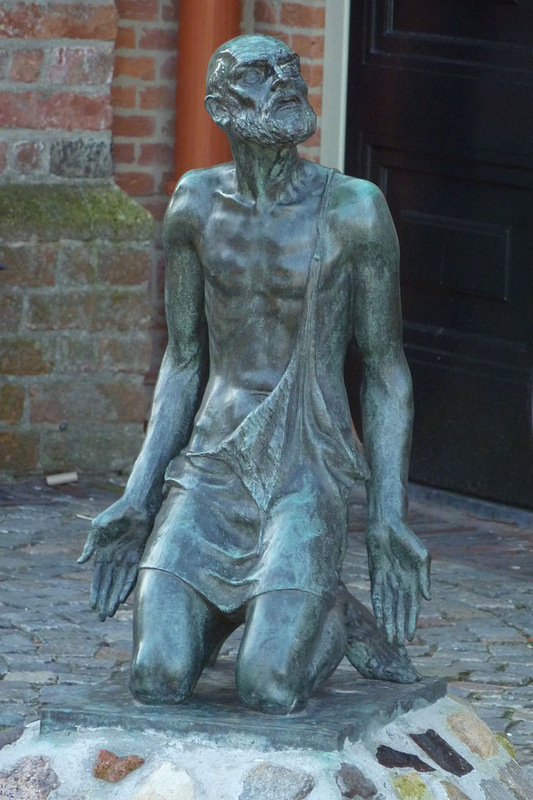 Original source: http://commons.wikimedia.org/wiki/File:Noordwijk_Sint-Jeroenskerk_beeld.jpg.